School is starting up around the Northwest this week and next week, so it’s time to start thinking about ways you can help support your children’s school(s). Schools are always in need of supplies, money for field trips, books for the library and much more, so any way that parents can get involved to help support the school will help them meet the needs of their students. 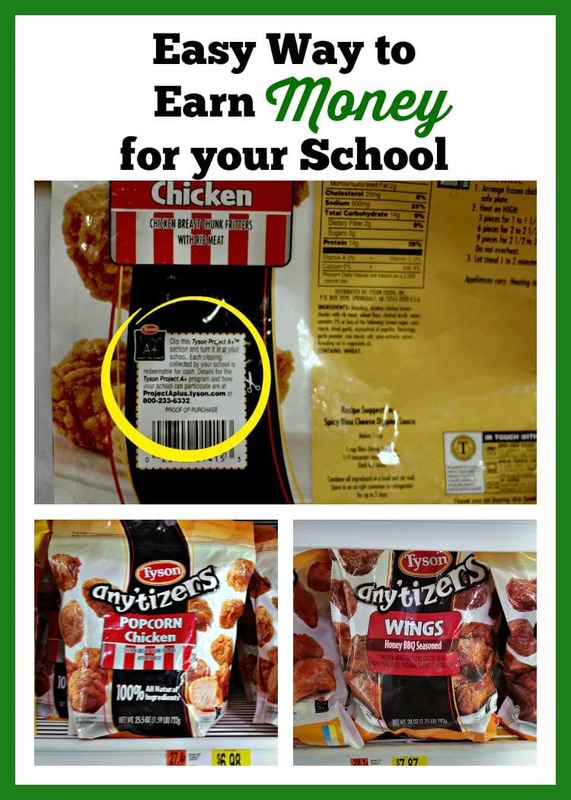 Last week, I shared with you about a new (to me) program with Tyson’s Foods – Tyson Project A+™ Program, where you can support your school by buying select Tyson® products and looking for the Tyson Project A+™ labels on the back. You can then clip the label off and submit the label to your school. I’d definitely recommend that you contact your school to make sure they know about this program and let the parent-teacher association (PTA) or other parent group knows to make announcements to parents as well. For every qualifying label that is submitted, Tyson® will give your school money to use however they need it the most. Every little bit counts & adds up to help the schools with school supplies, library books, art supplies & more. We just keep a baggie of labels right in our kitchen drawer so we can clip them & stick them in there & then bring them in occasionally. Our girls are the best ones at remembering the labels & making sure we don’t forget to clip them. 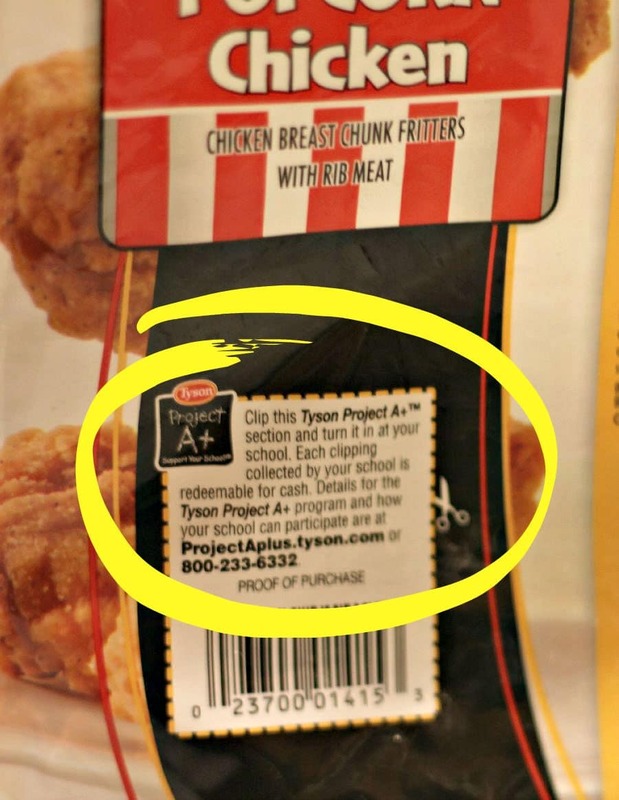 Families of students can get involved too – let family & friends know to look for the Tyson Project A+™ labels & clip the labels & save them for you to turn into your school. I love that it’s not only an easy way for you to support your school, but you can also get friends & family involved in supporting the school as well, without having to always ask them to sign up for othre fundraising options. This is something so simple that they can get into a habit of doing on a regular basis. Tyson® products are delicious & make for easy & convenient shortcuts for dinnertime too – make sure to check out our recipe for Homemade Sweet & Sour Chicken using Tyson Any’tizers® Popcorn Chicken. I love finding ways to still have healthy meals but using dinner shortcuts for those evenings when you’re on the go. You’ll want to make sure the next time you buy a Tyson® product, that it has a Project A+ label. You’ll find these labels on the back of the bag, so make sure to confirm that it has a label before you buy it, so you can clip it & turn it in to your school. If you’d like to give your school a boost to help support them at the start of this new school year, Tyson® is offering 5 schools the chance to win $1000 in Tyson Project A+™ labels. This contest goes through September 19, 2015. Schools can win by securing the top number of votes, so this is your chance to nominate your school & then tell all the school parents to vote, too, so your school can win! Let your school know you’ve nominated them & they may even be able to let parents know about the contest to vote. 1. Head to Walmart.com/TysonProjectAPlus & sign in to your Walmart.com account (you must be signed in to your Walmart account to be able to nominate your school. 2. Put in your zipcode and then choose your school from the list. 3. 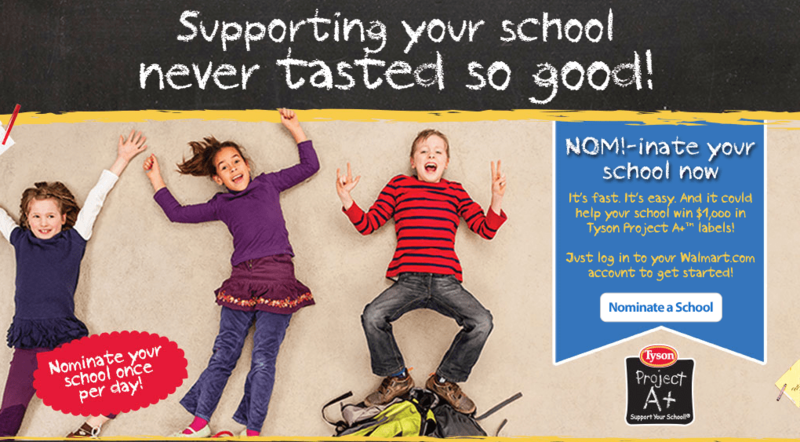 Nominate your school by sharing why your school needs a head start on collecting Tyson Project A+™ Labels. 4. To spread the word & have more people nominate your school, share on social media that you nominated your school. 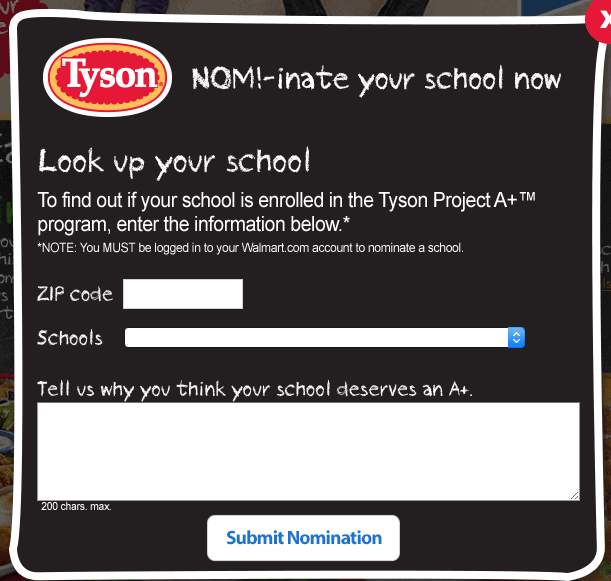 The school with the *most* nominations will receive a $1000 worth of Tyson Project A+™ labels. You can vote one time daily, so make sure to head back each day & make your nomination for your school! That $1000 in Tyson Project A+™ labels will be a great boost & encourage more parents to start collecting the labels to see what a difference they can help make, too. I am nominating my husband’s school where he is a teacher, as it is in a high need area in Tacoma, with the majority of students on free or reduced lunch. The teachers and administrators are making great strides with students & I know it will be put to very good use. His school has put into place so many awesome programs for students both during & after school hours and they are always searching for grants & other opportunities to provide even more opportunities. For example, last year they formed a partnership with a local bicycle club, which provided bicycles & gear for students to form the first Cycling Club. The goal was to get high school students outside & exercising more. They ended up having a number of students ride in the Seattle to Portland (STP) bike ride this summer for their very first year – that’s over 200 miles long! That’s pretty impressive for the first year of a new program! This is just an example of what schools can do when parents and community members partner with them to provide extra support for the students at a local school. You can do your part by clipping those labels to support your kids’ school or your local school if you don’t have kids in school!